Our affiliate program allows web publishers to link to the Lose Your Mind Development site and earn money from any resulting sale of our Printer's Apprentice software product. If you run a software directory, a blog or just like to recommend good software to friends and associates, you can earn money from your referrals. We offer linking web sites a generous 35% COMMISSION for each sale of our Printer's Apprentice software package. Our ecommerce partner, Avangate.com, provides the complete affiliate program administration tools for our products. When a visitor follows a link or banner from your site, Avangate keeps track of your Affiliate ID for 120 calendar days. Any order placed by the same user within that period guarantees your affiliate commission. You will receive a check from Avangate for your referrals. If you have any questions, let me know. Send an email to helpdesk@loseyourmind.com. Our ecommerce provider, Avangate, has all the details about the program. Start the process at this by clicking the button below. Once you have completed the sign up process, Avangate will allow you to join the Lose Your Mind Development affiliate network. Use the Avangate affiliate tools to generate links to our product pages and shopping cart. We also provide our affiliates with a variety of icons, screen shots and stock text that you can use on your web pages. They are available on the Avangate pages. We also make them available below for your convenience. Here are a variety of links, banners and buttons that you are free to use on your site. If you are looking for any other sales resources, please send an email to helpdesk@loseyourmind.com. Screen Shots: Please see the Printer's Apprentice screen shot page for more shots. Professional software for managing font files on Windows 10, 8 & 7 systems. Features an elegant Explorer-style interface for viewing TTF, OTF & Type 1 fonts. Has extensive catalog and font sample sheet printing. Includes full help file & uninstall. Printers Apprentice is a fantastic font manager for Windows 10, 8 & 7. Features an elegant Explorer-style interface for viewing TrueType, OpenType and Type 1 from any media. Compare fonts, view character sets and keyboard layouts. Font groups help manage large font collections with batch install and uninstall. Printing functions generate 8 font catalogs and 9 font sample sheets. Includes online help and a complete uninstaller. Printers Apprentice is a fantastic font manager for Windows Windows 10, 8 & 7. Whether you are a graphic artist, a publishing professional or a software enthusiast, if you have a lot of fonts, Printer's Apprentice will help you organize your collection. Printer's Apprentice features font browsing, previewing and printing for TrueType, Adobe Type, and OpenType fonts with a polished user interface. Browsing and preview functions let you examine fonts from any storage device without copying files or installing fonts. You can look at every character of each font, see how fonts look in a paragraph, find symbol characters on the keyboard and examine the copyright information embedded in font files. Printer's Apprentice also lets you examine multiple fonts at a time using the new Font Compare tab. Includes support for non-US character sets. Intelligent font install and uninstall tools let you manage fonts with more options than the Windows Control Panel. Use the font uninstall function to preview and trim unnecessary typefaces in your Windows setup. 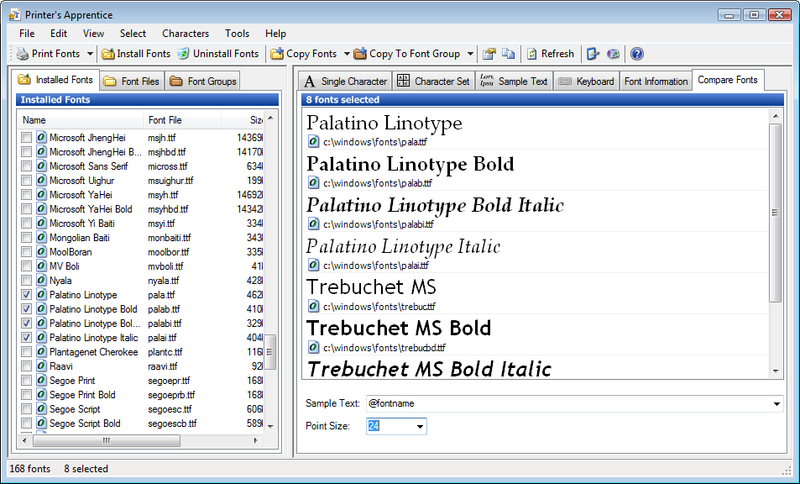 Font groups quickly installs and uninstalls user defined batches of fonts as needed for your projects. Font groups are stored as easy to access folders on your hard drive. Your fonts are not locked away in a proprietary database. Printer's Apprentice shows you how fonts look on the printed page with nine (9) different sample sheets and eight (8) different catalogs. Print styles include multi-column font lists, keyboard charts, character sets and single font layouts. Printer's Apprentice can easily print all the uninstalled fonts on CD-ROMs or other media. The new zoomable, multi-page print preview window shows you exactly what the printed output will look like. A full help system is included to get you started quickly. Printer's Apprentice is digitally signed and includes a complete uninstaller to cleanly remove the software from your system if needed. http://www.loseyourmind.com/pa80.aspx.